That’s Ness, Poo, Pokey, Picky, and the Bubble Monkey. 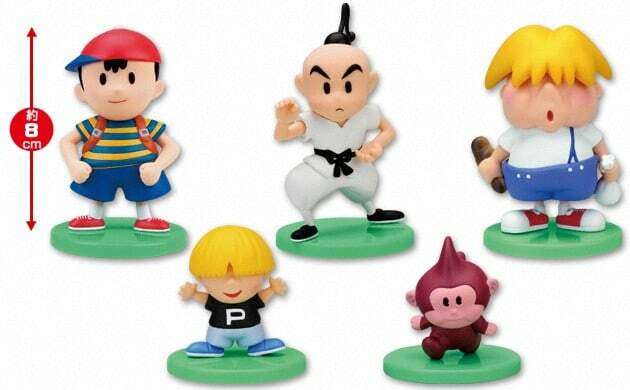 Note that these are mini-figures – during December and January normal sized figures of Ness, Paula, Jeff, Poo, and Pokey will also be released. While I’m at it, you can read more details about this over at Game Swag, a site I recently opened. We also have some details about some of the earlier MOTHER figures here, and if you want to see more info about other EarthBound/MOTHER merch in general, this is a good place to start. At some point I’ll talk more in detail about the new site, but for now, check it out if you get some free time! Well so far I’ve stuck well to my guns. May still end up with the Starmen, but we’ll see. Won’t be getting the larger M2 figures otherwise. Is that a piece of defecation Pokey is holding? I want Ness,Poo,and Bubble monkey!